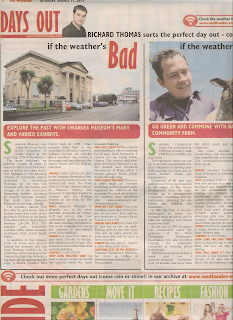 Below is my “Days Out” column from The Weekend supplement in the Saturday, August 24, 2013, issue of the South Wales Evening Post. After getting kitted up in the factory’s fashionable hairnets and aprons, the tour begins with a detailed talk about the history of chocolate, from its popularity among the ancient Olmecs and Aztecs of Central America to its discovery by Christopher Columbus and the Spanish Conquistador who conquered Mexico, Hernando Cortes. This is followed by a walk on the factory floor where you are shown the factory machinery and given a demonstration of how they melt, temper and re-mould chocolate into football shaped lollies, chocolate hearts and other bespoke items. For public tours places cost £8 for adults and £6 for children between 3 and 16 years old. Children under 3 years old are not allowed to be admitted. Visit www.thechocfactory.com. WHERE? The Chocolate Factory is located inside Swansea West Industrial Park, Fforestfach, Swansea. WHY? 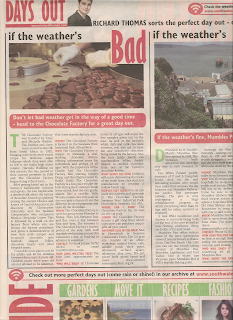 The Chocolate Factory is unique in Swansea: a real, working chocolate factory offering informative tours for individuals and groups of all ages. With the popularity of the Charlie And The Chocolate Factory film starring Johnny Depp, and the original novel by Roald Dahl, The Chocolate Factory is a fun place to take the kids during their summer break from school. And the tour guide, almost like a real-life Willy Wonka, makes sure everyone on the tour gets a chance to see the different factory equipment and taste all the chocolate. WHEN? The Chocolate Factory is open for group tours Monday to Friday. They run between four and five tours a day between 9am and 4pm. 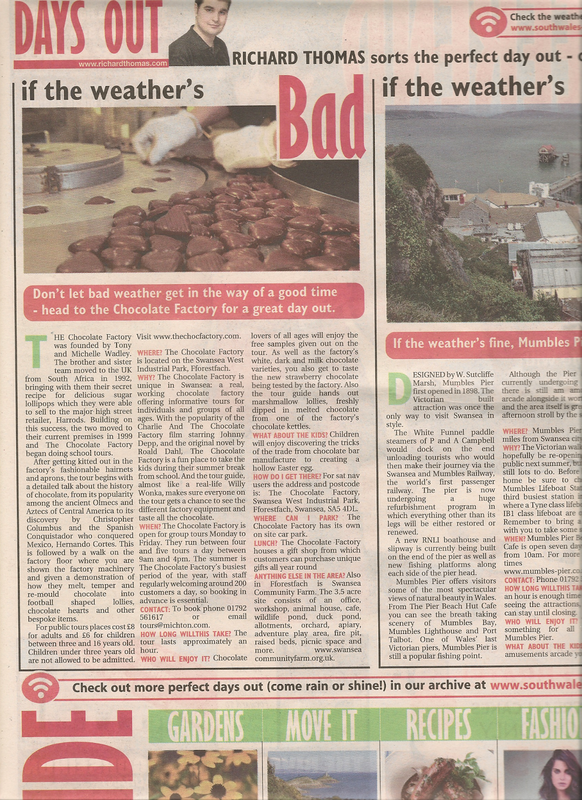 The summer is The Chocolate Factory’s busiest period of the year, with staff regularly welcoming around 200 customers a day, so booking in advance is essential. CONTACT? To book phone 01792 561617 or email tours@michton.com. HOW LONG WILL THIS TAKE? The tour lasts approximately an hour. WHO WILL ENJOY IT? Chocolate lovers of all ages will enjoy the free samples given out on the tour. As well as the factory’s white, dark and milk chocolate varieties, you also get to taste the new strawberry chocolate being tested by the factory. Also the tour guide hands out marshmallow lollies, freshly dipped in melted chocolate from one of the factory’s chocolate kettles. WHAT ABOUT THE KIDS? Children will enjoy discovering the tricks of the trade from chocolate bar manufacture to creating a hollow Easter egg. HOW TO GET THERE? For sat nav users the address and postcode is: The Chocolate Factory, Swansea West Industrial Park, Fforestfach, Swansea, SA5 4DL. WHERE CAN I PARK? The Chocolate Factory has its own on site car park. ANYTHING ELSE IN THE AREA? Also in Fforestfach is Swansea Community Farm run by local people for the benefit of the wider community. Activities held on the 3.5 acre site are run in a way that minimises any negative impact on the environment whilst helping to enhance local biodiversity and encourage nature conservation. The 3.5 acre site consists of an office, workshop, animal house, cafe, wildlife pond, duck pond, allotments, orchard, apiary, paddocks, adventure play area, fire pit, compost demonstration area, raised beds, and picnic space. The farm depends on membership and donations. A year membership only costs £5. Visit www.swanseacommunityfarm.org.uk. Designed by W. Sutcliffe Marsh, Mumbles Pier first opened in 1898. The Victorian built attraction was once the only way to visit Swansea in style. The White Funnel paddle steamers of P and A Campbell would dock on the end unloading tourists who would then make their journey via the Swansea and Mumbles Railway, the world’s first passenger railway. The pier is now undergoing a huge refurbishment program in which everything other than its legs will be either restored or renewed. A new RNLI boathouse and slipway is being built on the end of the pier as well as new fishing platforms along each side of the pier head. Mumbles Pier offers visitors some of the most spectacular views of natural beauty in Wales. From The Pier Beach Hut Cafe you can see the breath taking scenery of Mumbles Bay, Mumbles Lighthouse and Port Talbot. One of Wales’ last Victorian piers, Mumbles Pier is still a popular fishing point. Although the Pier itself is currently undergoing repairs, the land beside The Pier is an entertainment complex comprising bars, a restaurant, and ice-skating rink. The Pier even has its own amusements arcade, so there’s still plenty to see. WHERE? Mumbles Pier is just five miles from Swansea City Centre. WHY? The Victorian walkway will hopefully be re-opening to the public next summer, but there is still lots to do. Before heading home be sure to check out Mumbles Lifeboat Station, the third busiest station in Wales, where a Tyne class lifeboat and a IB1 class lifeboat are operated. Remember to bring a camera with you to take some snaps. WHEN? Mumbles Pier Beach Hut Cafe is open seven days a week from 10am. For more opening times visit www.mumbles-pier.co.uk. HOW LONG WILL THIS TAKE? About an hour is enough time to spend seeing the attractions, but you can stay until closing. WHO WILL ENJOY IT? There is something for all ages at Mumbles Pier. WHAT ABOUT THE KIDS? In the amusements arcade you can try your luck at the slot machines while the children play all the latest video games. There is also ten pen bowling and an array of prizes to be won on the cranes. The bright and airy space has something for everyone. HOW DO I GET THERE? For sat-nav users the address and postcode is: Amusement Equipment Co Ltd, Old Lifeboat Cottage, Mumbles Road, Mumbles, Swansea, SA3 4EN. LUNCH? The pier's café offer a range of freshly-cooked meals from homemade soups to fish and chips. The Pier also has its own pub. After lunch head to Verdi’s just a short walk away for an ice cream. WHERE CAN I PARK? There is large car park right next to Mumbles Pier. ANYTHING ELSE IN THE AREA? There is lots more to see in Mumbles. Oystermouth Castle was built around 1100 by William de Londres and later rebuilt in the 13th century by the infamous de Breos family, after being burnt down by the Welsh twice. There is a small charge of £2.50 for adults and £1.50 for children over 5 for admission. Family tickets for four people are available for £6.50 and children under five visit for free. Remember to bring cash with you as there are no credit/debit card facilities on the castle site. Also wear suitable footwear for the uneven terrain. Visit www.oystermouthcastle.wordpress.com. 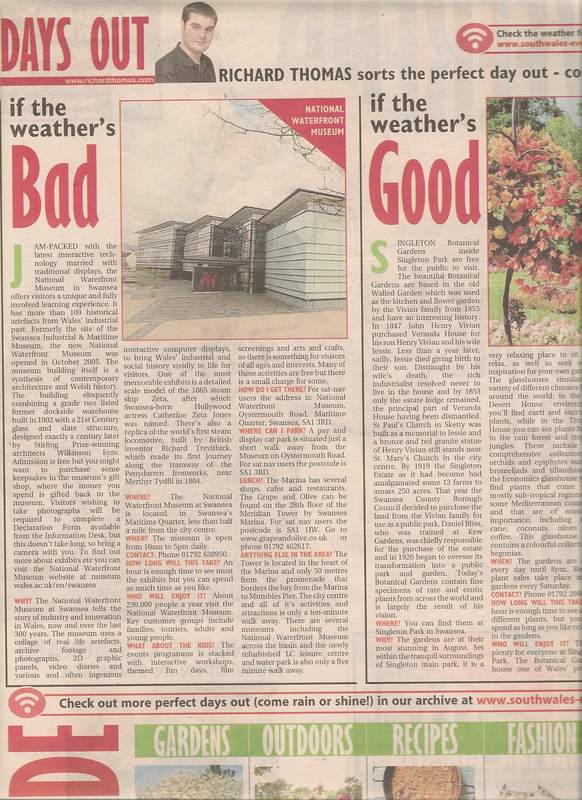 Below is my “Days Out” column from The Weekend supplement in the Saturday, August 17, 2013, issue of the South Wales Evening Post. Swansea Museum was originally set up by the Royal Institution of South Wales, a local group who wanted to investigate all aspects of history, the arts and science at the beginning of the 19th century. Described by the Swansea poet Dylan Thomas as “a museum that belongs in a museum”, the impressive stone building was completed in 1841 in the grand neo-classical style, and is the oldest museum in Wales. WHERE? Today visitors are able to see Swansea Museum at four locations: the main museum on Oystermouth Road, The Tramshed on Dylan Thomas Square in Swansea Marina, the museum’s Collections Centre in Landore and the floating exhibits in the dock by The Tramshed. WHY? Swansea Museum is allegedly one of the most haunted locations in Wales. Staff and visitors alike have experienced spooky activity in the main building. According to one member of staff a mysterious “hooded figure” has been seen on several occasions on the stairs and strange “tapping”, “cold spots” and even “whistling” have also been reported. Admission is free at the museum but you’re not allowed to photograph some of the exhibits. A wide variety of keepsakes including handmade Welsh pottery and glassware, Egyptian memorabilia and Victorian jewellery are all for sale in the Museum Shop. WHEN? Swansea Museum is open from 10am to 5pm every Tuesday to Sunday. Last admissions are at 4pm. The museum is closed Mondays and bank holidays. CONTACT? Phone on 01792 653763. HOW LONG WILL THIS TAKE? An hour is plenty of time to see all the exhibits inside the main museum building. WHO WILL ENJOY IT? The exhibits and exhibitions offer something for all ages. Until September 1 visitors can see Inside Welsh Homes. This touring exhibition from the Royal Commission on the Ancient and Historical Monuments of Wales offers a unique glimpse inside Welsh homes through time. The exhibition showcases archival images of Welsh homes ranging from the humblest cottages and urban terraces to the grandest of country houses. A selection of the museum's furniture and domestic collections also helps to bring these fascinating images to life. WHAT ABOUT THE KIDS? There are a wide range of activities including workshops and crafts organised for children at the museum. To check what events the museum have scheduled visit www.swansea.gov.uk/swanseamuseum. HOW TO GET THERE? The main building is next door to the LC2. For sat nav users their address and postcode is: Victoria Road, Swansea, SA1 1SN. LUNCH? Food and drink are available next door in the LC Coffee Shop in the LC main reception. There is also the Poolside Bistro on the LC ground floor which offers spectator views of the waterpark and a wide menu of home-cooked family meals. WHERE CAN I PARK: Next door the LC has an on site car park. Parking costs £2 for a two hour stay and an extra pound for every hour after that for up to a five hour ticket. ANYTHING ELSE IN THE AREA? Just down the road is the National Waterfront Museum which houses more than 100 historical artefacts from Wales’ industrial past. Formerly the site of the Swansea Industrial & Maritime Museum, the new National Waterfront Museum was opened in October 2005. The museum building itself is a synthesis of contemporary architecture and Welsh history. The building eloquently combining a Grade II listed former dockside warehouse built in 1902 with a 21st century glass and slate structure, designed exactly a century later by Stirling Prize-winning architects Wilkinson Eyre. Admission is free but you might want to purchase some keepsakes in the museum’s gift shop, where the money you spend is gifted back to the museum. Visitors wishing to take photographs will be required to complete a Declaration Form available from the Information Desk, but this doesn't take long, so bring a camera with you. To find out more about exhibits etc. you can visit the National Waterfront Museum website at www.museumwales.ac.uk/en/swansea. 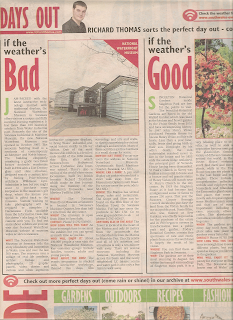 Swansea Community Farm was conceived in 1992 but it wasn’t until 1998 that a suitable site was found for the city farm. The registered charity was setup to provide opportunities for local volunteers to develop new skills running the farm and to teach visitors about the environment. Volunteers of all ages and abilities have been instrumental in all stages of the farm’s development from the start: setting up a management committee, consulting with the community, planning the site layout and building site structures. In 2004 the front of site was landscaped to make the entrance more attractive, and in 2006 the workshop and animal house was built. The arrival of the first animals to the farm also brought a new interest from adults and children wanting to work with animals in a farm setting. Soon after a raised bed garden was constructed to provide opportunities for volunteers with mobility constraints to participate in farm activities. By the end of 2006 an apiary was constructed under the guidance of The West Glamorgan Beekeepers Association who also provided training for volunteers interested in learning about beekeeping. The farm now opens six days a week and has 4 purpose-designed buildings, over 50 animals and more than 500 child, youth and adult volunteers. The farm depends on membership and donations. A year membership only costs £5. Visitwww.swanseacommunityfarm.org.uk. WHERE? Swansea Community Farm is located in Fforestfach, Swansea. WHY? Swansea Community Farm is a community-led farm run by local people for the benefit of the wider community. Activities held on the 3.5 acre site are run in a way that minimises any negative impact on the environment whilst helping to enhance local biodiversity and encourage nature conservation. The 3.5 acre site consists of an office, workshop, animal house, cafe, wildlife pond, duck pond, allotments, orchard, apiary, paddocks, adventure play area, fire pit, compost demonstration area, raised beds, and picnic space. WHEN? The Farm is open six days a week: Monday to Saturday from 10am to 4pm. HOW LONG WILL THIS TAKE? An hour is long enough to see the farm, but you can stay until closing. WHO WILL ENJOY IT? The farm provides a fun location where people of all ages can learn about the environment, organic gardening and animal care. WHAT ABOUT THE KIDS? There are over 50 different animals to see, including sheep, pigs, chickens, rabbits and ducks. HOW DO I GET THERE? For sat nav usesrs the address and postcode is: 2 Pontarddulais Road, Fforestfach, Swansea, SA5 4BA. LUNCH? The Farm’s Community Café serves a range of mouth-watering dishes using fresh local produce when available. Prices range from £3.00 for soup of the day to chicken or veggie curry for £5.95. WHERE CAN I PARK? The Farm has its own car park. ANYTHING ELSE IN THE AREA? The Chocolate Factory is unique in Swansea: a real, working chocolate factory offering informative tours for individuals and groups of all ages fter getting kitted up in the factory’s fashionable hairnets and aprons, the tour begins with a detailed talk about the history of chocolate, from its popularity among the ancient Olmecs and Aztecs of Central America to its discovery by Christopher Columbus and the Spanish Conquistador who conquered Mexico, Hernando Cortes. This is followed by a walk on the factory floor where you are shown the factory machinery and given a demonstration of how they melt, temper and re-mould chocolate into football shaped lollies, chocolate hearts and other bespoke items. The Chocolate Factory is open for group tours Monday to Friday. They run between four and five tours a day between 9am and 4pm. For sat nav users their address and postcode is: The Chocolate Factory, Swansea West Industrial Park, Fforestfach, Swansea, SA5 4DL. To book phone 01792 56161. 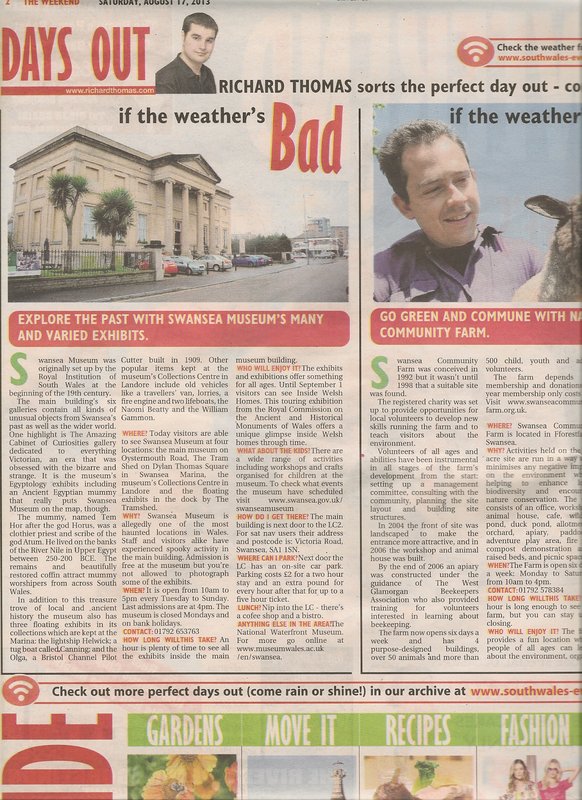 Below is my “Days Out” column from The Weekend supplement in the Saturday, August 10, 2013, issue of the South Wales Evening Post. 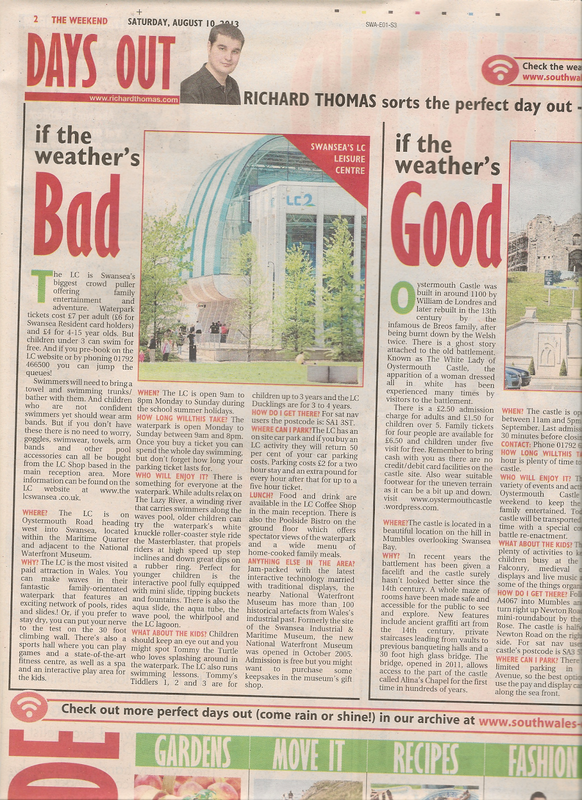 The LC is Swansea’s premier leisure complex offering entertainment and adventure for the whole family. Waterpark tickets cost £7 per adult (£6 for Swansea Resident card holders) and £4 for 4-15 year olds, but children under 3 years old can swim for free. And if you pre-book on the LC website or by phoning 01792 466500 you can jump the queues! Swimmers will need to bring a towel and swimming trunks/bather with them. And children who are not confident swimmers yet should wear arm bands. But if you don't have these there is no need to worry, goggles, swim wear, towels, arm bands and other pool accessories can all be bought from the LC Shop based in the main reception area. More information can be found on the LC website at www.thelcswansea.co.uk. WHERE? The LC is situated on the main Oystermouth Road heading west into Swansea, located within the Maritime Quarter and adjacent to the National Waterfront Museum. WHY? The LC is the most visited paid attraction in Wales and with so many different activities to choose from it’s easy to see why. You can make waves in their fantastic family-orientated waterpark that features an exciting network of pools, rides and slides, including the much loved wave pool! Or, if you prefer to stay dry, you can put your nerve to the test on the 30 foot climbing wall, the perfect place to experience the excitement and challenges of rock climbing! There’s also a sports hall where you can play games and a state-of-the-art fitness centre, as well as a luxurious spa to relax in, and even an interactive play area for the kids. WHEN? The LC is open 9am to 8pm Monday to Sunday during the school summer holidays. CONTACT? Phone: 01792 466500 or Email: enquires@the-lc.co.uk. HOW LONG WILL THIS TAKE? The waterpark is open Monday to Sunday between 9am and 8pm. Once you buy a ticket you can spend the whole day swimming, but don’t forget how long your parking ticket lasts for. WHO WILL ENJOY IT? There is something for everyone at the waterpark. While adults relax on The Lazy River: a winding river that carries swimmers along the waves pool. Older children can try the waterpark’s own white knuckle roller-coaster style ride, the Masterblaster, that propels riders at high speed up step inclines and down great dips on a rubber ring. Perfect for younger children is the interactive pool fully equipped with mini slide, tipping buckets and fountains. There is also the aqua slide, the aqua tube, the wave pool, the whirlpool and the LC lagoon. WHAT ABOUT THE KIDS? Children should keep an eye out and you might spot Tommy the Turtle who loves splashing around in the waterpark. The LC also runs swimming lessons. Tommy's Tiddlers 1, 2 and 3 are for children up to 3 years and the LC Ducklings are for 3 to 4 years. These swimming lessons are designed to introduce your baby to the water and gradually build confidence and work on the basic swimming strokes. HOW TO GET THERE? For sat nav users the postcode is: SA1 3ST. LUNCH? Food and drink are available in the LC Coffee Shop in the main reception. There is also the Poolside Bistro on the ground floor which offers spectator views of the waterpark and a wide menu of home-cooked family meals. WHERE CAN I PARK? The LC has an on site car park and if you purchase an LC activity they will return 50% of your car parking costs. Parking costs £2 for a two hour stay and an extra pound for every hour after that for up to a five hour ticket. ANYTHING ELSE IN THE AREA? Jam-packed with the latest interactive technology married with traditional displays, the National Waterfront Museum in Swansea offers visitors a unique and fully involved learning experience for the 21st century. The museum has more than 100 historical artefacts from Wales’ industrial past. Formerly the site of the Swansea Industrial & Maritime Museum, the new National Waterfront Museum was opened in October 2005. The museum building itself is a synthesis of contemporary architecture and Welsh history. The building eloquently combining a Grade II listed former dockside warehouse built in 1902 with a 21st century glass and slate structure, designed exactly a century later by Stirling Prize-winning architects Wilkinson Eyre. Admission is free but you might want to purchase some keepsakes in the museum’s gift shop, where the money you spend is gifted back to the museum. Visitors wishing to take photographs will be required to complete a Declaration Form available from the Information Desk, but this doesn't take long, so bring a camera with you. To find out more about exhibits etc. you can visit the National Waterfront Museum website at www.museumwales.ac.uk/en/swansea. Oystermouth Castle was built around 1100 by William de Londres and later rebuilt in the 13th century by the infamous de Breos family, after being burnt down by the Welsh twice. There is also a ghost story attached to the old battlement. Known as The White Lady of Oystermouth Castle the apparition of a woman dressed all in white has been experienced many times by visitors to the battlement. The White Lady is usually seen weeping, with the back of her dress ripped away and a series of bloody welts on her back. The woman then abruptly vanishes before confused onlookers can offer her any assistance. Reports of the woman in white go back centuries, leading some paranormal investigators to believe she might have died after being tortured on the medieval whipping post which still stands in the castle’s dungeon. There is a small charge of £2.50 for adults and £1.50 for children over 5 for admission. Family tickets for four people are available for £6.50 and children under five visit for free. Remember to bring cash with you as there are no credit/debit card facilities on the castle site. Also wear suitable footwear for the uneven terrain. For more information visit www.oystermouthcastle.wordpress.com. WHERE? Oystermouth Castle is located in a beautiful location on the hill in Mumbles overlooking Swansea Bay. WHY? In recent years the battlement has been given a facelift and the castle hasn't looked better since the 14th century. A whole maze of rooms have been made safe and accessible for the public to see and explore. New features include ancient graffiti art from the 14th century, private staircases leading from vaults to previous banqueting halls and a 30 foot high glass bridge. The bridge, opened in 2011, allows access to the part of the castle called Alina's Chapel for the first time in hundreds of years. The chapel was added to the castle in the 14th century and marks the attraction’s highest medieval point. If visitors look close enough graffiti art from the 14th century can be spotted thanks to the improved view. WHEN? The castle will be open daily between 11am and 5pm until 30 September. Last admissions are 30 minutes before closing. HOW LONG WILL THIS TAKE? An hour is plenty of time to see the castle. WHO WILL ENJOY IT? There's a variety of events and activities at Oystermouth Castle this weekend to keep the whole family entertained. Today the castle will be transported back in time with a special costumed battle re-enactment. WHAT ABOUT THE KIDS? There are plenty of activities to keep the children busy at the castle. Falconry, medieval cookery displays and live music are just some of the things organised. HOW DO I GET THERE? Follow the A4067 into Mumbles and then turn right up Newton Road at the mini-roundabout by the White Rose. The castle is halfway up Newton Road on the right hand side. For sat nav users the castle’s postcode is SA3 5TA. LUNCH? There are lots of nice places to eat nearby in Mumbles. For desert you can enjoy a Joe’s ice cream near the sea front. The inside of the Mumbles parlour is adorned with photos of the ice cream parlour’s founder, Joe Cascarini, and there is also plenty of space, making it the perfect option for large families or groups. Visit www.joes-icecream.com. WHERE CAN I PARK? There is very limited parking in Castle Avenue, so the best option is to use the pay and display car parks along the sea front. ANYTHING ELSE IN THE AREA? Mumbles Pier offers visitors some of the most spectacular views of natural beauty in Wales. From The Pier Beach Hut Cafe you can see the breathtaking scenery of Mumbles Bay, Mumbles Lighthouse and Port Talbot. In the amusements arcade you can try your luck at the slot machines while the children play all the latest video games. There’s also ten pen bowling and an array of prizes to be won on the cranes. The bright and airy space has something for everyone. And before heading home be sure to check out Mumbles Lifeboat Station, the third busiest station in Wales, where a Tyne class lifeboat and a IB1 class lifeboat are operated. Visit www.mumbles-pier.co.uk. 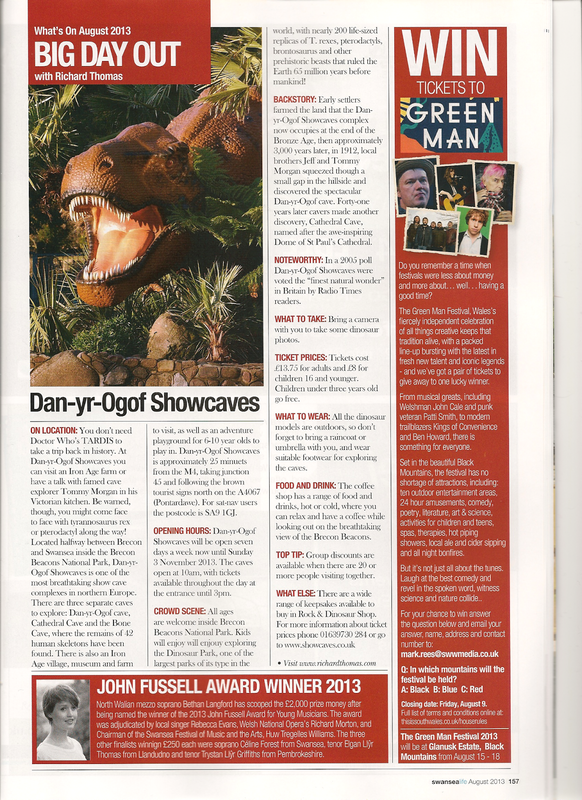 My column for the August 2013 issue of Swansea Life magazine. ON LOCATION: You don’t need Doctor Who's TARDIS to take a trip back in history. At Dan-yr-Ogof Showcaves you can visit an Iron Age farm or have a talk with famed cave explorer Tommy Morgan in his Victorian kitchen. Be warned, though, you might come face to face with tyrannosaurus rex or pterodactyl along the way! Located halfway between Brecon and Swansea inside the Brecon Beacons National Park, Dan-yr-Ogof Showcaves is one of the most breathtaking show cave complexes in northern Europe. There are three separate caves to explore: Dan-yr-Ogof cave, Cathedral Cave and the Bone Cave, where the remains of 42 human skeletons have been found. There is also an Iron Age village, museum and farm to visit, as well as an adventure playground for 6-10 year olds to play in. Dan-yr-Ogof Showcaves is approximately 25 minuets from the M4, taking junction 45 and following the brown tourist signs north on the A4067 (Pontardawe). For sat-nav users the postcode is SA9 1GJ. OPENING HOURS: Dan-yr-Ogof Showcaves will be open seven days a week now until Sunday 3 November 2013. The caves open at 10am, with tickets available throughout the day at the entrance until 3pm. CROWD SCENE: All ages are welcome inside Brecon Beacons National Park. Kids will enjoy will enjouy exploring the Dinosaur Park, one of the largest parks of its type in the world, with nearly 200 life-sized replicas of T. rexes, pterodactyls, brontosaurus and other prehistoric beasts that ruled the Earth 65 million years before mankind! BACKSTORY: Early settlers farmed the land that the Dan-yr-Ogof Showcaves complex now occupies at the end of the Bronze Age, then approximately 3,000 years later, in 1912, local brothers Jeff and Tommy Morgan squeezed though a small gap in the hillside and discovered the spectacular Dan-yr-Ogof cave. Forty-one years later cavers made another discovery, Cathedral Cave, named after the awe-inspiring Dome of St Paul’s Cathedral. 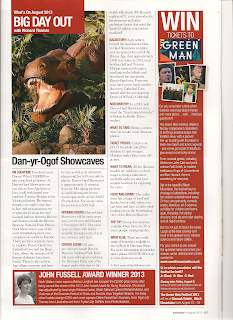 NOTEWORTHY: In a 2005 poll Dan-yr-Ogof Showcaves were voted the “finest natural wonder” in Britain by Radio Times readers. WHAT TO TAKE: Bring a camera with you to take some dinosaur photos. TICKET PRICES: Tickets cost £13.75 for adults and £8 for children 16 and younger. Children under three years old go free. WHAT TO WEAR: All the dinosaur models are outdoors, so don’t forget to bring a raincoat or umbrella with you, and wear suitable footwear for exploring the caves. FOOD AND DRINK: The coffee shop has a range of food and drinks, hot or cold, where you can relax and have a coffee while looking out on the breathtaking view of the Brecon Beacons. TOP TIP: Group discounts are available when there are 20 or more people visiting together. WHAT ELSE: There are a wide range of keepsakes available to buy in Rock & Dinosaur Shop. For more information about ticket prices phone 01639730 284 or go to www.showcaves.co.uk. Richard Thomas is the author of Para-News and Sci-Fi Worlds from Bretwalda Books. Visit www.richardthomas.com. 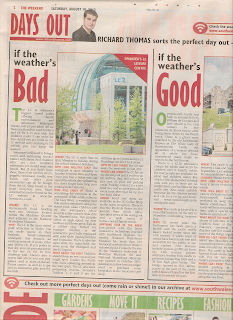 Below is my “Days Out” column from The Weekend supplement in the Saturday, August 3, 2013, issue of the South Wales Evening Post. ANYTHING ELSE IN THE AREA? The Tower is located in the heart of the Marina and only 50 metres from the promenade that borders the bay from the Marina to Mumbles Pier. The city centre and all of it's activities and attractions is only a ten minuet walk away. There are several museums including the National Waterfront Museum across the basin and the newly refurbished LC leisure centre and water park is also only a five minute walk away. Singleton Botanical Gardens inside Singleton Park are free for the public to visit. The beautiful Botanical Gardens are based in the old Walled Garden which was used as the kitchen and flower garden by the Vivian family from 1853 and have an interesting history. In 1847 John Henry Vivian purchased Veranda House for his son Henry Vivian and his wife Jessie. Less than a year later, sadly, Jessie died giving birth to their son. Distraught by his wife’s death, the rich industrialist resolved never to live in the house and by 1853 only the estate lodge remained, the principal part of Veranda House having been dismantled. St Paul's Church in Sketty was built as a memorial to Jessie and a bronze and red granite statue of Henry Vivian still stands near St. Mary’s Church in the city centre. By 1919 the Singleton Estate as it had become had amalgamated some 12 farms to amass 250 acres. That year the Swansea County Borough Council decided to purchase the land from the Vivian family for use as a public park. Daniel Bliss, who was trained at Kew Gardens, was chiefly responsible for the purchase of the estate and in 1920 began to oversee its transformation into a public park and garden. Today’s Botanical Gardens contains fine specimens of rare and exotic plants from across the world and is largely the result of his vision. WHERE? You can find them at Singleton Park in Swansea. WHY? The gardens are at their most stunning in August. Set within the tranquil surroundings of Singleton main park, it is a very relaxing place to sit and relax, as well as seek some inspiration for your own garden. The glasshouses simulate a variety of different climates from around the world: in the hot Desert House environment you'll find cacti and succulent plants, while in the Tropical House you can see plants found in the rain forest and tropical jungles. These include the comprehensive collection of orchids and epiphytes such as bromeliads and tillandsias. In the Economics glasshouse you’ll find plants that come from mostly sub-tropical regions and some Mediterranean countries, and that are of economic importance, including sugar cane, coconuts, olives and coffee. This glasshouse also contains a colourful collection of begonias. WHEN? The gardens are open every day until 8pm. Regular plant sales take place in the gardens every Saturday. HOW LONG WILL THIS TAKE? An hour is enough time to see all the different plants, but you can spend as long as you like relaxing in the gardens. WHO WILL ENJOY IT? There’s plenty for everyone at Singleton Park. The Botanical Gardens house one of Wales' premier collections of florae, with spectacular herbaceous borders and large glasshouses packed full of displays. The gardens are also home to Ty'r Blodau, an educational and visitor centre available for school visits, workshops and meetings. WHAT ABOUT THE KIDS? Children will enjoy feeding the ducks. There’s also a children’s adventure playground and Crazy Golf course inside Singleton park. HOW DO I GET THERE? You can find them at Singleton Park in Swansea. For sat nav users the postcode is SA2 8QD. LUNCH? Inside the park is the Pub On The Pond family pub which serves a wide range of 2 meals for £10 and other great deals. Call 01792 298023. WHERE CAN I PARK? Parking can be found on Sketty Road outside Singleton Park. ANYTHING ELSE IN THE AREA? Running along the promenade, and situated opposite the road it is named after, is Ashleigh Road Pitch & Putt golf course. The course has no handicap requirements so it is ideal for beginners of all ages and those who just want to have some fun. It is also a great course for more experienced players to brush up on their pitching and putting skills.